Is notifying HR dept where Offenders work a good way to reduce Drunk Driving? So employers are the new mummy-papa? The state should treat adults like adults. Punish them as per law, throw them into jail, but please spare everyone this nanny nonsense. I checked out the image attached and was reading the replies and one of the commenters had posted something to the effect of “The cops shouldn’t be doing this as this could destroy the persons career if HR knows about their habit of drinking and driving.” This comment sparked an immediate reaction which is what led to this post. From a quick check on the internet the letter appears to be real and there is a very polarized debate ongoing about it. I will be replying back on the Twitter thread as well with a link to this post but wanted a blog post as it gives me more space to give context. Basically, drinking and driving is a big problem in India. Even in cities like Bangalore where there are frequent checks for DUI, I personally know people who drink & drive. They use strategies like waiting for an extra hour after closing time/event end to avoid cops. Some of them take the back roads to avoid known blockades location for testing. If I can, I do try to get people to take cabs back but its an uphill battle. In one case this guy could barely stand but wanted to ride his bike home and when I told him to take a cab his reply was “It’s ok I will be fine once I am on the bike” as if it would magically make him sober. In 2017 73,741 drunk driving cases were registered in Bangalore. I couldn’t find the numbers for 2018 but am still searching, I will update the post if I find it. The article didn’t have the breakdown on how many repeat offenders were there in the list but I wouldn’t be surprised if a significant count was from repeat offenders. A lot of the folks don’t care about the fine or think that paying a bit of money is a good option to get away with something that risks lives. It would be one thing if they were only risking their own lives but they also end up killing innocent people in accidents. Take this incident from New Years 2019 in Mumbai where a drunk driver killed a class 9 student who was waiting for his friend alongside a road and had the bad luck of being at the wrong place at the wrong time. We have to face facts, fines are not working as well as we want them to. People still think that they can get away with this behavior with minimal consequences. The fix is to increase the stakes. The cops first tried to do that by increasing the fines and jail duration but that hasn’t had such a major impact. So the question becomes how do we raise the stakes further? 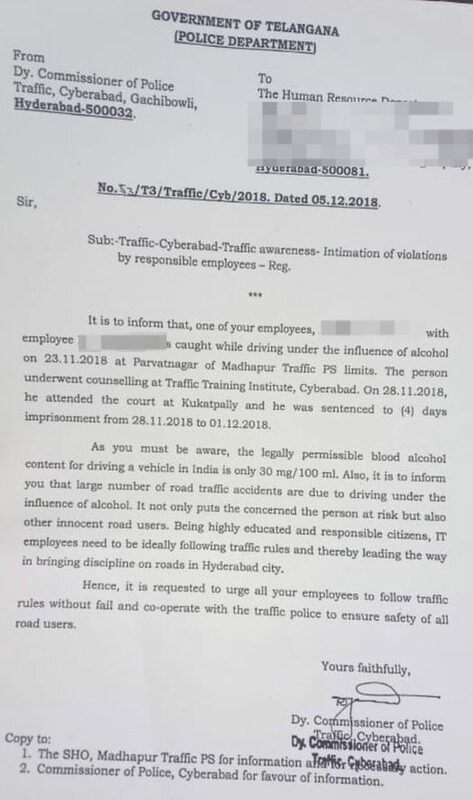 One way would be to do what Hyderabad cops are doing and start notifying the HR department of the companies where the offenders work, in cases of repeat offenders or when people are significantly over the allowed limit. If you know that your job might be impacted when you drink and drive then a lot of people will think twice about doing it. To clarify I am not saying that this should be done everytime. I think that they shouldn’t do this when the person is over the limit by a small amount e.g. if they had 3 glasses instead of 2 but if they had 10 glasses (for example) then yes their offices should be told and the HR will take a call if they want to have such a reckless employee working for them and what action if any should be taken against them. As for the impact on the job/wreak the career of a person driving under the influence I have just this to say “Good”. Why should we be concerned about the impact to the career of someone who drives under the influence and refuses to take accountability for their actions? Shouldn’t we be more concerned about the impact to the families who lose loved ones to these senseless drivers? What about the impact to people who are crippled in drunk driving related accidents?